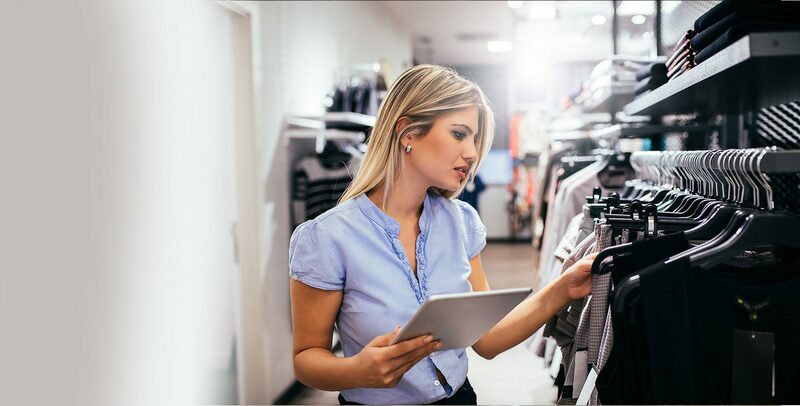 Hybrid Shop is KFI’s solution for the creation of a truly omnichannel approach to the customer which, starting from any point of contact, is able to offer the consumer a unique and customized experience in line with his expectations. Hybrid Shop answers to the emergent behaviours of the consumers with a new business strategy which puts the customer at the centre along his whole purchase process, independently from where it originates and ends: in a store, on a computer or on a smartphone. Places them on the worktop and associates the single articles to the e-commerce order through barcodes scanning. Through the palmtop device, he sends the shipment request to the courier and prints the waybill and the shipping label. The procedure ends with the automatic notification to the customer and to the system of the order fulfillment. Today, the majority of the purchases are performed using multiple channels. The consumer expects to be able to search and identify a product without limits or barriers; with Hybrid Shop it is possible to assist the customer in its purchase path without ever losing contact with him. Hybrid Shop allows to enable and easily manage new services, such as, for example, withdrawal and return of goods ordered on-line, creating new occasions for contact and new sales opportunities in-store. By identifying the purchaser, it is also possible to know his purchasing habits and preferences to establish a more personal and fruitful relation. Hybrid Shop allows to transform stores into warehouses from which e-commerce orders can be fulfilled quickly and efficiently. An opportunity which also allows to operate in remote markets or in those separated by customs barriers, whose volumes do not justify the on-site creation of new distribution centers yet.